LEN - www.lankaenews.com | Crook Polgampola’s bribe list with CID : President has sold ‘appointments’ for billions.! 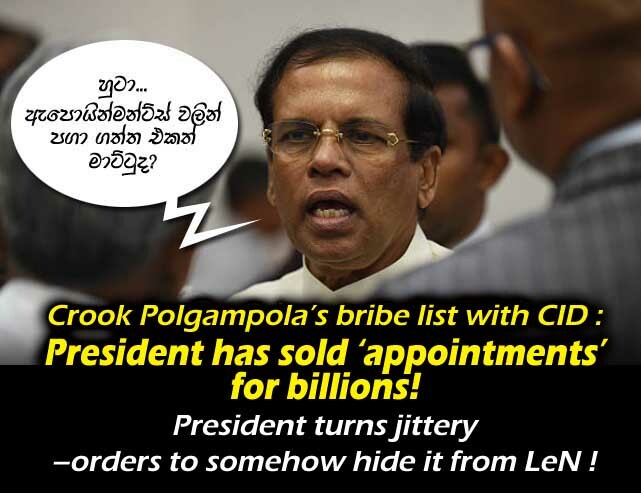 Crook Polgampola’s bribe list with CID : President has sold ‘appointments’ for billions.! President turns jittery –orders to somehow hide it from LeN ! (Lanka-e-News - 18.May.2018, 5.25AM) The most notorious bribe taker Anurudha Polgampola appointed as State Timber Corporation chairman by moronic president Gamarala who is a most close pal of his ( Anurudha) for a long time, has been a receiver of bribes over a long period ! Polgampola who lasted in his latest position as chairman for just six days , following his arrest on the 16 th morning by the CID had disgorged this information during the interrogation. During an examination of the bank accounts of Polgampola , it had come to light there had been a large number of deposits ranging from Rs. 200,000.00 to Rs. 2.5 million which he could not account for. It has been confirmed that these were not deposits made by him , and those have been credited to his accounts in bank branches located in various districts. These monies have been collected by Polgampola as kickbacks to arrange meetings with the relevant individuals to get appointments with the president. Among these depositors , there are a number of foreign investors , according to the CID. During the extensive investigations it has come to light , this business of bribe taking had been carried on by the suspect citing the grounds that he would get an appointment to meet president Gamarala through the latter’s lackeys and lickspittles. It has also been revealed that Gamarala was fully aware that his lackeys and lickspittles were collecting bribes and kickbacks because nobody can meet him without his knowledge. Among those at the top who collected bribes citing the grounds that they would get appointments with Gamarala are : Nalin Ranaweera , Weerakumara Dissanayake, Athureliye Rathane , Mahanama ( now remanded ) the ex chief of staff of Gamarala , president’s co ordinating secretary Shiral Lakthileke who is already tainted with accusations of NGO rackets , and Maithri Gunaratne , while Chamuditha Samarawickrema , the present member of staff of Gamarala , Miyuru Bashitha Liyanage, the cordinating secretary of parliamentry affairs and Dharmasri Bandara the media director are also behind this bribery collection racket of securing appointments with the president. What is most rudely shocking is, all these ‘bribery appointments’ have been planned at the Paget Road residence of president Gamarala. Based on the investigations conducted so far by the CID , some foreign investors have paid sums as large as Rs. 2.5 million for these ‘bribery appointments’ with the president . During the recent past it is Chathurika Sirisena who has arranged all the appointments in regard to foreign investors , it is now learnt. Presidents of other countries in the world have secretaries to arrange appointments with them , but our president Gamarala from the very inception never had such a secretary . Now it is obvious to the world why Gamarala the pagarala did not have one. When the CID had informed the president of this discovery on the 16 th , the president has flown into a rage (pretended), has berated all and sundry and cancelled all the appointments that were planned for the next few days. The presently most embattled president whose name is being implicated in every racket detected , and locks the stable after the horse has bolted , had frightened his presidential staff by issuing a dire warning that he would take strict punitive measures against them if this monumental corruption is splashed in the newspapers . He had specially instructed his staff to ensure that the news of these corrupt activities do not reach Lanka e news . In fact the president has discussed with two of his closest cronies whether they could speak to Lanka e news editor and see to it the reports already published by LeN against him are withdrawn . He has entrusted this task of coming to some peaceful understanding with the editor , to these two cronies .